The untypical physician Dr. Mary Jane Guazon-Uy answers her own question in this novella acknowledging a debt to Gabriel Garcia-Marquez’s and Jorge Luis Borges’s magical realism, with Neil Gaiman hinting at how to let a magical tale tell itself. It begins with a gripping portrait of a woman with an unusual gift when nature spirits still roamed 19th century Naga. Maestra Angge, a highly educated woman, holds her own alone among a conquered people. She would have been called a babaylan before the Spaniards came. When the friars slandered born healers like her as “aswang,” who fed on human entrails, the people knew better. They trusted her to diagnose their ailments with her third sight, heal them with herbs and restore balance between body and spirit with a few choice words. She was also a single parent to an only child whose father sailed off years ago and never returned. A “throwback to ancient times, when women ruled Kabikolan and had equal freedom with the men,” the Maestra headed a huge household staffed by Agta whose first home was the forested Mt. Isarog, with nature spirits abounding, looming over her ancestral home. One day Maestra Angge brings home a very sick man. The man is writhing in pain, dying from a rare disease she cannot quite identify. Anita feels the moment like doomsday as hard rain starts to fall, immobilizing their kalesa from fetching a priest to administer the last sacraments just in case. The patient is greenish now, his body undulating with a huge creature in his innards. The Maestra’s hands tremble as she pounds herbs to kill the unknown monster. The man drinks her powerful potion and instantly vomits foul-smelling mucus, with a huge worm “like a gigantic newborn larva” wriggling out of his mouth. This monster worm hisses, hurling itself at the Maestra’s assistant Venancio who quickly slashes it in half. Just as quickly, the Maestra stabs one end with her surgical knife. Venancio pours holy water on now two “demon worms,” which hurl themselves out the window. They’re swallowed in a whirlpool of floodwater -- and the storm dies down. Revelation comes the next morning. The man recovering from near death opens the huge book he dropped in the balcony the night before. Responding to inquisitive Anita, who brought him the book, he begins to tell her the story of his desperate quest. He could not die until he returned this ancient prayer book he stole three centuries ago. =The owner is none other than the Spanish missionary Pedro Bautista, a fine musician and charismatic preacher who led his Franciscan community in 16th century Philippines. Bit by bit, the thief tells Anita how he followed this monk’s trail -- from his prayer cave in San Francisco del Monte in Manila to a parish he founded and the healing hot springs he came upon in the province of Laguna, all through her own coastal Nueva Caceres. But always he misses the monk and must follow him the way all to Japan. The Spanish governor general sent him there as ambassador of peace to the Shogun Toyotomi Hideyoshi then casting a conqueror’s eye on a Philippines wreathed in tales of gold. 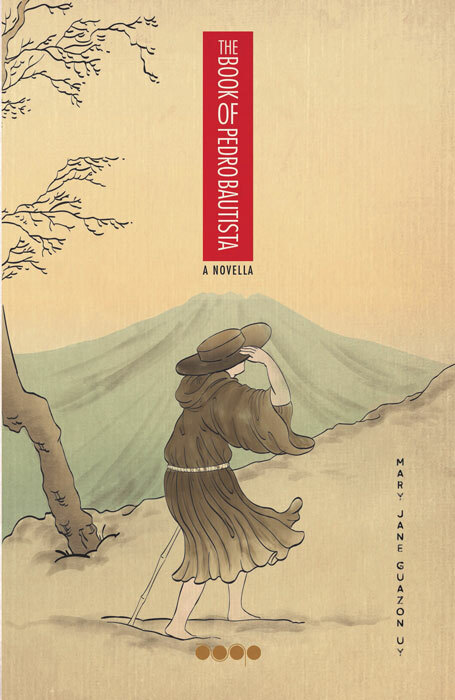 Fray Bautista wins the tolerance of the temperamental shogun, who grants him permission to found a Christian community in Nagasaki. But in Nagasaki, too, is where he meets martyrdom when court intrigues and jealous Shinto and Buddhist priests poison the Shogun’s mind on the danger of the growing influence of this foreigner from the Spanish empire. Dr. Uy hews to witness accounts of Fray Bautista lanced to death on a cross with 25 Christian followers. Many said they saw him saying Mass in several places after death. Ships at sea attested to seeing lights shining on the hill of execution. After two months of exposure to the elements, all the martyrs’ bodies were reported incorrupt. Others noted carrion crows avoiding their dead flesh. Church tradition adds that believers cut their bodies and crosses into miraculous relics, erasing all the martyrs’ traces on that hill. As fate and the author would have it, the book thief arrives just after Fray Bautista’s death. Totally unmoved by all the stories of miracles, he even kills the messenger Bautista sent him before he died, just to tell him he knew who stole his book and it would torment him until he made amends. Indeed, the thief continues to suffer all manner of ailments, often at the brink of death. Weary of his growing legend in Japan as a man who could not die, he returns to his life at sea. This is how he finds his way to Naga where Maestra Angge finds him half-dead that ominous dusk. Now begins the strangest twist. As innocent Anita asks the thief questions on who and what he really was, he slowly begins to feel like she was his own daughter. He tells her his name, Rafael – Señor Paeng, the Agta servants call him. As her patient recovers his health, something strange begins to happen to Maestra Angge, too as Señor Paeng begins to sing in fine tenor, playing the piano untouched for years. She who frostily kept her many suitors at bay for years, suddenly takes to the kitchen, creating delicious dishes to dine on in elegant dinners with Anita and Señor Paeng. She sings in the garden now while he helps manage the household, consults him on her business enterprise, laughingly gossips about their mutual acquaintances. The lady’s in love and so is the gentleman with a dark past unexplainably losing the countless years marked on his face. They’ve become a loving family. For one gloriously happy year, Anita and her mother choose to ignore charming Señor Paeng’s frequent hints on how he would have to leave them one day. On her way home from school, Anita glimpses Señor Paeng and chases after him, only to find it’s a demon. Strangling her with his long claws, she’s close to her last breath when he suddenly lets her go and vanishes down an alley. Running home trembling, she shows her mother and Señor Paeng wounds on her neck. The moment has come for the cursed to leave the only family he’s ever known. Sparing them from sharing his fate, he leaves both mother and daughter in great sorrow. Years pass. Anita grows with her city, studies abroad, returns to help her aging mother, gradually taking over both her livelihood and her mission. Señor Paeng sends presents wherever he was. When Maestra Angge dies, Anita buries her like an expectant bride. Señor Paeng sends a rare handsome wreath from out of nowhere. More years pass. Two more conquerors invade the country then give back its freedom. One day a formally dressed emissary arrives for Doña Anita Arca, telling her that Señor Paeng has chosen her as his heir. His curiosity about this aging married woman’s relationship with the “rich young man” he saw on his untimely death bed is all over his face. Anita says nothing as she receives the last present from the only father she ever knew -- the title to their home in Naga and whatever remains after his generous donations to the Church and many charities. Now the sole repository of Señor Paeng’s mysterious past, Anita is deeply gratified that he has finally earned his rest, happily acceding to an old rogue’s written request for her prayers. But the tale does not end there. When Naga’s Holy Week procession comes around, Anita glimpses a Franciscan monk bowing to her, a heavy book in his hands, left ear freshly cut like Fray Bautista just before his martyrdom. Now she remembers. She glimpsed him, too, at her mother’s funeral and again, when Señor Paeng’s messenger brought her glasses just when her eyesight was failing. Now she wonders if he was in that religious procession when the demon fled before she breathed her last. “Few Filipinos know San Pedro Bautista, a saint who once walked our land. I just had to bring him back to life in fiction,” says author Mary Jane Guazon-Uy. Now tell me if that’s not magical realism.